The recently opened Rendezvous Dining Pavilion at MSU Bozeman with nine different concept options for dining pleasure. Mike Kosevich, Associate Director of Culinary Services shared, “We decided about 2013 when we had a consultant come in and look at all our facilities. They had determined that they were pretty old, pretty dated. We needed to move into the next century so we started to tour around the country.” A team looked at college dining from Colorado State Boulder to Harvard to MIT to many others. They discovered a new style of cooking called platform cooking where food was prepared in front of the diner, cooked to order. 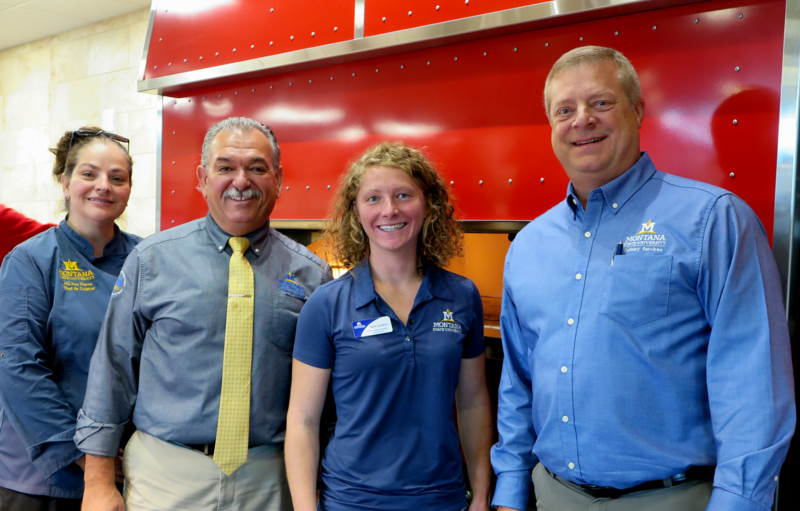 The Culinary Services Team: (From left to right) Executive Chef Jill Flores; Associate Director of Culinary Services, Mike Kosevich; Farm to Campus Coordinator Kara Landolfi; and Director of Culinary Services, Richard Huffman. No longer would a student experience what I had in college many years ago of picking up a plastic tray to stand in line for food slopped onto a plate. No student who eats at Rendezvous Dining Pavilion will taste food that seem to take on a shade of yellow with essences of chicken bouillon and margarine. These same students will not feel the dread I did when it was time to eat. 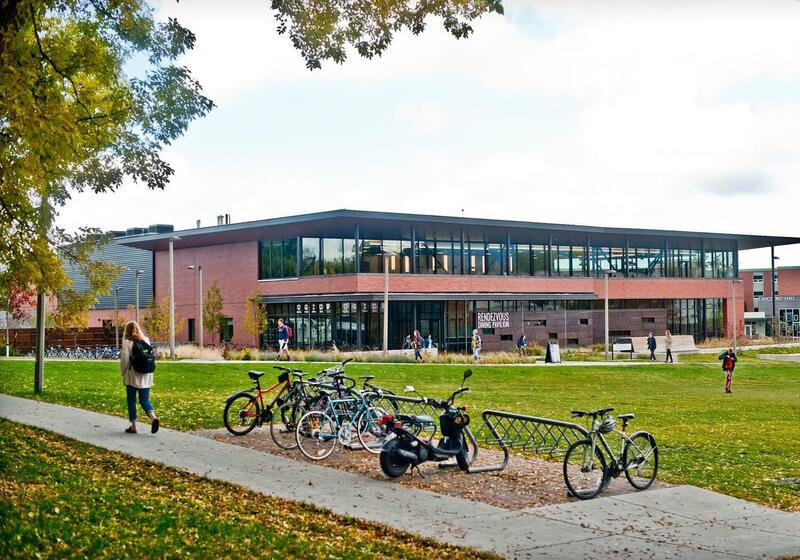 The courtyard style with individual cook to order concepts came onto the MSU Bozeman campus in 2015 with Miller Dining Hall. The new way of serving food would be a game changer according to Kosevich. He shared that when students are choosing what college they want to attend, “residence halls, dining facilities and fitness centers are the three big areas” they consider. Outside view of the Rendezvous Dining Pavilion blending in glass, wood and metal with brick. In the 28,878 square-foot building, there are varied groupings of gathering space. Outside balcony seating provides for great views of the nearby mountains while cozier seating surrounds a fireplace with larger meeting rooms and then intimate spaces for more privacy. The smaller format allows for local sourcing. Kara Landolfi, the Farm to Campus Coordinator for Culinary Services shared, “We partner with more than a hundred different vendors from throughout the state and get in local food into our operations.” Last year, Landolfi said the university spent $1.75 million on Montana food “which is nearly a quarter of all our food purchases in the year so it’s a pretty big percentage.” Also, the university has been able to “partner with different businesses throughout the state to develop products specifically for us or distribution routes specifically for us.” Vendors include Wilcoxsin’s Ice Cream along with Tumblewood Teas from Big Timber and safflower oil from Oil Barn in Big Sandy. Landolfi shared programs closer to home such as the Steer-A-Year program through the College of Agriculture where steers, feed and money are donated to the college allowing students to learn to raise a steer to bringing it to market. Pigs are also being purchased from 4H Auctions. Landolfi said, “We are getting pork from future producers. Hopefully from the state that not only encourages them to try to continue in an agricultural future, but also to understand MSU has invested in their future as well. 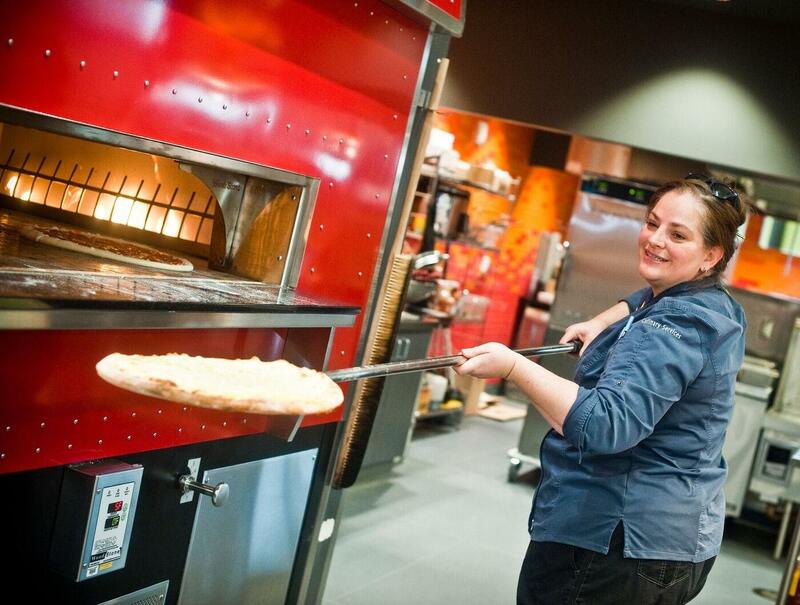 Executive Chef Jill Flores lifts a pizza into the Italian wood fired oven. Nine themed restaurants include The 89’er Diner, with a chrome backdrop and neon signage, serving up smash burgers, fries and shakes, and Rosso Italian with modern detailing of red enamel and stainless steel with a brick pizza oven and pasta stations. At the Crossroads, special dietary needs including vegan and gluten free options are fulfilled. At XO, wok and pho stations cook up Asian flavors while at De La Mesa, Mexican cuisine includes freshly cooked hand pressed tortillas. Forge 406 with decor sporting cattle brand designs from local ranchers offers smoked and rotisserie options. One Eleven, bakery and espresso outlet named after the longitude of Bozeman, allow for customers to bring in their own mugs, encouraging sustainability. To provide convenience there is also a takeout window for ordering coffee to go. 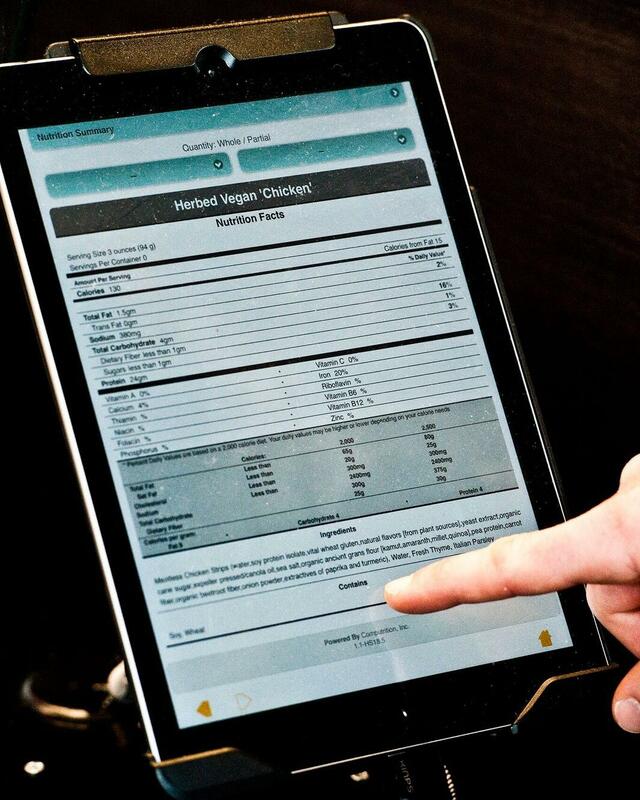 An iPad is available at each station with nutritional information about every item served including whether an ingredient is sourced locally. At each food station is an iPad that provides information about every dish served in the courtyard. Nutritional information is provided along with where the item originated. This way those with special dietary needs can find out what is in the food. 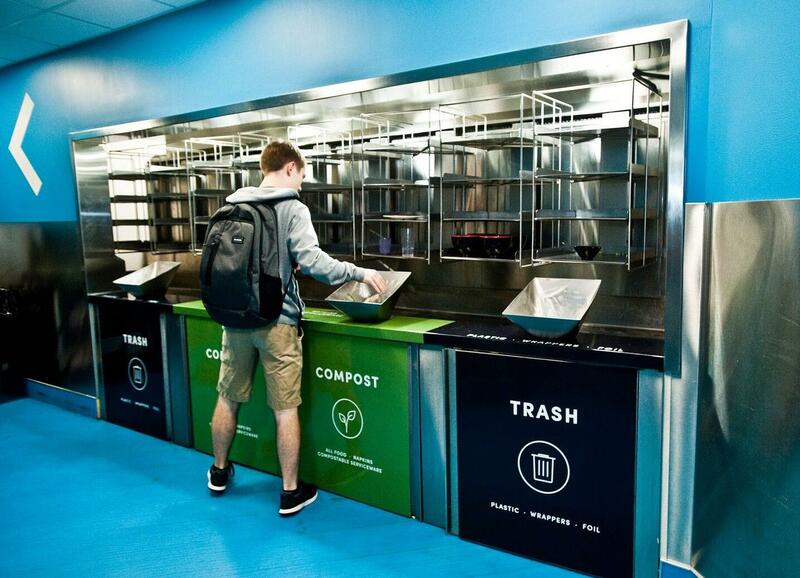 Another benefit of the new system of dining is the reduction of waste. A student did a study on the waste generation at Miller Dining Hall before and after their remodel in 2013 with results indicating waste went down by half. Kosevich expressed surprise as he believed, “because with all the options you would have thought they (the students) would have gone up.” With reducing the size of utensil and plates and instigating composting, waste decreased. Landolfi added that with students taking the responsibility to take their plates to the dish area and separating their own food into compost and waste, they are more aware of what they are eating and throwing away. “It’s unlimited access to food once you’re in the dining hall but you don’t have to take an entire serving of something,” she continued. The Dish Drop encourages diners to separate their foodstuffs and garbage from dishes and utensils that can be washed and reused. On the horizon, Huffman shared some upcoming opportunities. A new indigenous food initiative with incorporation of Native American food into the dining options is being explored. Also, Huffman hopes to collaborate with the Gallatin College’s Culinary Arts program providing actual working situations for students in the program. 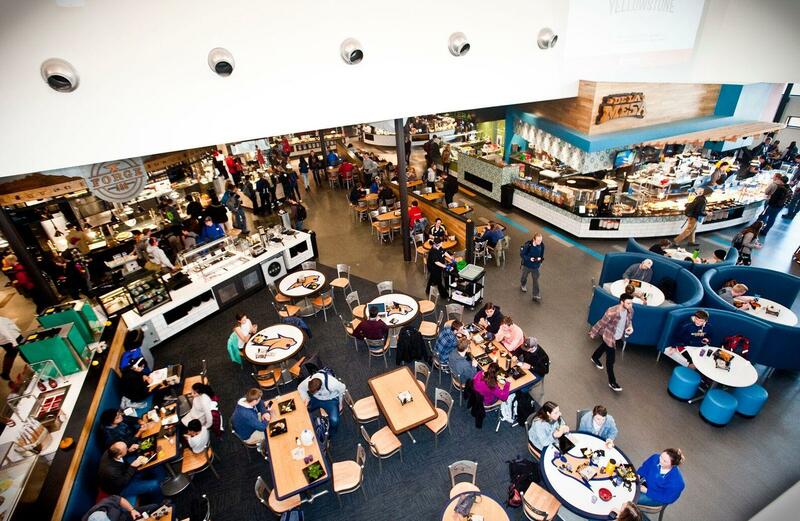 With the new concept, it will be easier for the dining services to incorporate new ideas and add items to the menu in the future. This new way of dining has generated much excitement with incredible potential.